After 44 years without a championship, the Washington Capitals nabbed the franchise’s first Stanley Cup in June. And then they partied about it. They partied, you guys. Oh, sure, teams have “partied” before. But how many pulled the full From Here to Eternity in a public fountain? How man took some strangers on a party bus to get impulse tattoos? How many chugged beers mid-interview on the Jumbotron at a baseball game? How many stole a girl’s Pride hat? (Venmo that girl, Braden Holtby!) How many crashed a fancy restaurant and sprayed diners with a seltzer gun? And how many players and staff insisted on doing kegstands—“Cup stands”—out of the Stanley Cup? The answer is none, apparently, and now no other team ever will, because it’s probably illegal now. [Stanley Cup Minder Philip] Pritchard repeatedly praised how the Capitals have reverently handled the Cup, but he said he’s been “advising” them to quit the Cup stands for fear of damage. Still, there were at least two instances as recently as forward Chandler Stephenson’s day with it on Aug. 24 and former assistant coach Lane Lambert’s on Aug. 26. Yes. The Washington Post reports that the Drunkington Sloppitals invented a Cup tradition so joyously dumb that it’s never allowed to happen again. I don’t know what frat parties are like because my college didn’t have them (what we had: a cappella groups!) but I’m pretty sure this is exactly like when your frat is allowed to book a social in the new business school atrium and then suddenly people are drinking flavored Stoli out of the planters and then someone else shows up with a bottle of Dawn like “let’s make this a foam party!” and then no student groups are allowed back ever again. Except this social was three months long and crossed multiple continents. Historic. “Everyone broke that rule though,” the source added. Actually, while we’re on the subject, let’s talk about Alex Ovechkin’s summer. This dude! Remember how many times he made everyone sing “We Are the Champions”? Remember when he invited his teammates to eat like $40k of caviar out of it? (I did the math.) Remember his romantic slow dance with Lord Stanley? My dude took the Cup to bed with such palpable fool bliss that I had to get it on a T-shirt. In his rally speech, he established an iconic victory slogan and also heroically destroyed the gender binary. And then he had a baby! I mean, come on! Here’s my question: Given how much fun we now know other teams could have been having and weren’t, do any previous Stanley Cup wins actually count? Oh sure, they technically “do,” I guess. But do they? The last person to have this much fun winning a Cup was Tyler Seguin, and the Bruins immediately got rid of him because of it. “Ooh, we put the Cup in Mario Lemieux’s swimming pool!” This party looks medium at best. 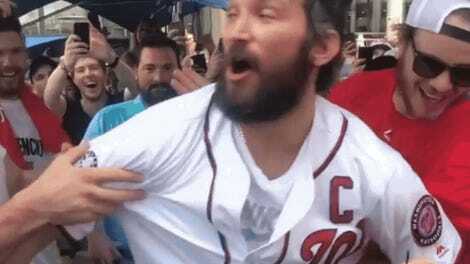 It’s worth mentioning, of course, that what’s distinguished the Capitals’ party summer has been less its intensity than the degree to which the fans have been invited into it. I know other teams probably “enjoyed” “themselves” after winning a Stanley Cup. Maybe not all of them wanted to stroll down the sidewalk of their city with it. That’s fine. Maybe, to be extremely fair and balanced, not all of them wanted to go on a staggering public bender for like five straight days. But guys, you have to understand. D.C. has, for my entire adult life, been a joke of a sports town: a cursed hellhole where promising teams love to choke for no reason. It’s the year of our Lord 2018 and our football team is still a racist slur, which is very cool. Sure, our soccer team was good for a while, but who cared? The most satisfying moment in the history of the Nationals was earlier this week when they were 69-69. This city has a staid no-fun reputation, an armpit summer climate, and all the grim political baggage of at least two locally unpopular clown kings. Particularly in the Ovechkin era, Caps fans have had no parties at all. For a decade we’ve had the privilege to watch one of the greatest scorers of all time in our city, a generous-hearted physical genius with a perfectly complementary center around which various extremely good teams were built. And yet we could not get past Jaroslav Halák or Sidney Crosby or whoever in the playoffs. (Don’t misunderstand me. Sidney Crosby is also a very good hockey player. But also: shut up, Sidney Crosby! You’ve done enough!) We truly believed our chance had passed. Our GM said it had passed! You get my point, and this is territory covered so extensively as to be practically its own genre, but I’ll sum it up in case you’re not open to consuming another 7,000 words of D.C. sports content: We’ve been sad. But for one week in June, it all seemed worth it. For one summer, all the pain of all those losses seemed a narrative necessity, the bitter conditions required for that cathartic burst of sweet, thoughtless idiot joy. We leapt in fountains. We scaled lampposts. We fell off our barstools and knelt on our living room floors and wept. 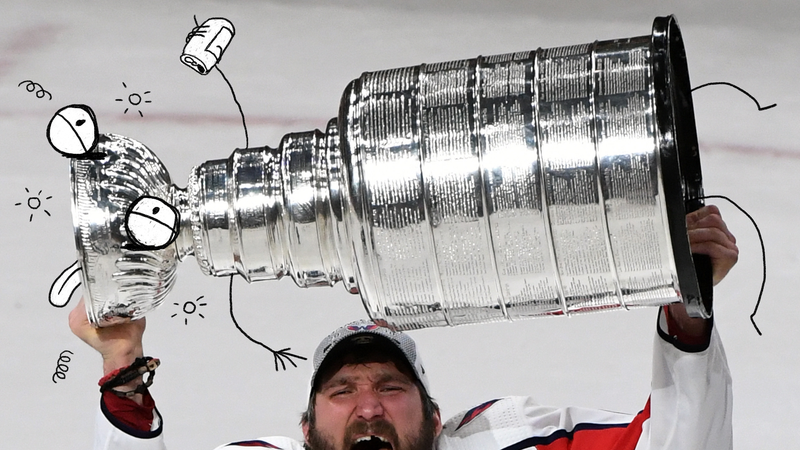 And the Capitals’ willingness to celebrate publicly, to make their own stupid happiness accessible to us, gave our own exultation a communal weight—a sense that the irrational one-sided emotions fans project onto our favorite sports boys were, in some impersonal but genuine way, understood and reciprocated. You know when you’re hammered in a club bathroom waiting for the hand dryer and a stranger is like, “Oh my God, you’re soooo beautiful,” and you’re like, “No, YOU are beautiful,” and for one transcendent moment by the Dyson Airblade you sincerely love each other? Basically that. For one summer, fans and athletes alike partied so hard that no one will ever be allowed to do our stupid party thing ever again. We asked each other “How is the pasta [of victory], Devante?” And we answered ourselves: It was so good, babe. It was so good. Hey, maybe it’s not over. Elena Delle Donne and the Mystics reached the WNBA Finals for the first time. Wayne Rooney is lighting it up at D.C. United. There’s a “new vibe” in Skins camp. Maybe it’s Washington’s time to rise. Maybe we’re turning things around. Back to back, baby! Chug chug chug! Woooooooooooo!! Hahaha, just kidding. We love to be garbage! But what a great summer. Rave Sashayed is a D.C. native and medium-level fun-haver. She is on Twitter.